Geographicity? Say that 3 times fast. Learned a new word today, geographicity. It’s in the title of an upcoming edX MOOC offered by a group of Swiss geographers: Exploring Human’s Space: an Introduction to Geographicity. A class designed to “explore how geography, cartography, urbanization and spatial justice play a role in shaping the notion of human space.” Sounds marvelous and could be, if done well, an interesting entry into the somewhat opaque social-science side of my beloved discipline of geography. The word itself – geographicity – is unlikely to ever make the OED. It was coined sometime after 1999 by two philosophers, Gary Backhaus and John Murungi. I first saw its definition (geographicity = the spatial component of all phenomena) in the preface of their 2007 book, Colonial and Global Interfacings: Imperial Hegemonies and Democratizing Resistances. 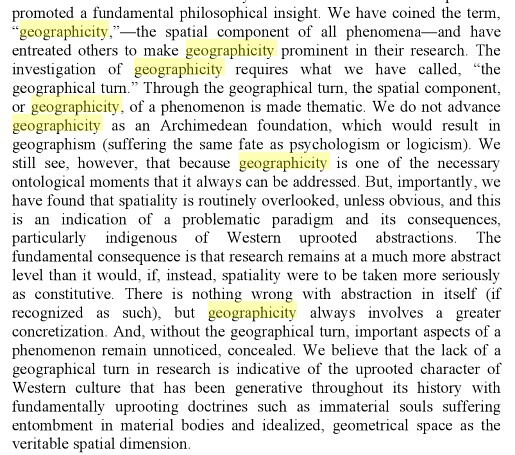 Geographicity also figures prominently in Esoscapes: Geographical Patternings of Relations, and Lived Topographies and their Mediational Forces. Here’s a passage from where I first saw the term discussed, from the preface of the Colonial and Global Interfacings books. Go ahead, read it through and challenge yourself to understand. I have, several times, and I’m still clueless. Absurdly and gratuitously confusing academic-speak. I really do have much respect for social theorists. Some of my best friends are social theorists. (okay, not really). I’ve enjoyed the rich dialogue between fellow geographers about just this topic recently. In this case, it’s philosophers writing and not geographers, but, still, I’d argue that this passage lies at the extreme edge of English-language communication. This entry was posted in education, geography, humanities, social sciences. Bookmark the permalink.